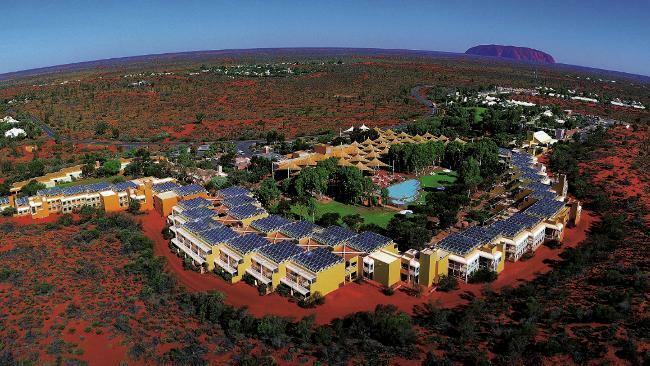 The central Australian town of Alice Springs is not home to many major chain hotels, although they do have a Crowne Plaza, which gets the number 1 spot on Tripadvisor. With that ranking in mind I checked out the prices and found a stay 3 pay 2 offer which seemed like a very good deal. I booked myself in to a standard room and arrived from Melbourne via Qantas (see my previous blog post for the trip report). I rented a Hertz Toyota Camry and drove to the hotel, free parking is available for those with cars. At check-in I was told the pool was out of action due to heavy rains, it was going to be unusable for a couple of days. That was disappointing because I had been hoping for a dip considering the hot weather! The front desk staff advised we could use the hotel next door's pool if we wished. The hotel features a series of 3 story buildings connected by covered walkways that face in to the central pool area. Rooms are simple but quite comfortable. There is only an old CRT tv, no LCD screens here! Here is a shot of the room, featuring 2 double beds. 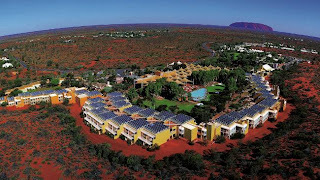 Considering the other options in Alice Springs, Crowne Plaza was a good choice. It's about 2km from the CBD though, so if you don't have a car it's quite a walk. There is a couple of restaurants including a Thai restaurant which I'm told is quite good, although I didn't try it. I also did not try the breakfast buffet, so I can't comment on that. Overall I was quite comfortable and I will choose Crowne Plaza again when I'm next in the Alice. While in Alice I enjoyed a visit to the Royal Flying Doctor Service, the old Gaol and a visit to the Anzac Hill lookout. For dinner I went to the tourist favourite, Overlanders Steakhouse. It's a very 'Aussie' experience and was good fun, I even ate some camel which was something new... it was quite tasty really! After a short stay in Alice I drove to Uluru/Ayers Rock, it was a great desert drive and I was so pleased to finally be in the Aussie outback, although, it was much greener than usual due to recent heavy rains. At the Ayers Rock Resort I pitched a tent in the campground. The resort features all you could need (at inflated prices of course), including swimming pool, supermarket, ATM's, petrol station and mobile phone network! I took the budget option and bought some meat from the supermarket and cooked up a BBQ under the stars... which are simply amazing at night in the Australian outback. The following day I walked around the base of the rock, choosing not to climb it as requested by the local Aboriginal people and park rangers. Why destroy such a wonderful natural phenomenon like Uluru!? It was such a great experience to see both Uluru and Kata Tjuta - I highly recommend it to everyone. After lunch at the Uluru cafe it was time to get back in the car and drive back to Alice Springs. You need to give yourself enough time to get back by nightfall, it's about a 3.5 to 4 hour drive. Driving after nightfall on the dark desert highways voids your car rental insurance, don't risk it! After another night in Alice Springs and dinner at Lasseters, the local casino, it was time to return to Melbourne. There are two airline options from Alice Springs to Melbourne, Qantas and Tiger Airways. Tiger had some bargain fares on offer so I booked with them on a flight to Melbourne's second airport, Avalon. Since I took this trip, Tiger have changed the flight from Alice to go into Melbourne-Tullamarine instead. I checked in online and had already printed the boarding passes so it was just a matter of showing up at the gate. The inbound flight from Avalon arrived on schedule, and after a quick turnaround we boarded the Airbus A320. Parked beside us was a Qantaslink Boeing 717-200, bound for Perth. The flight was almost completely full and I was unfortunate enough to be seated behind 3 Australian girls who were very drunk and loud. They had a friend visit them for most of the flight standing in the aisle, swearing and being loud and obnoxious almost the whole way home. It was NOT a pleasant flight. I guess that teaches me for flying Tiger, right? At least the flight was on schedule despite some pretty awful weather covering most of eastern Australia, and dumping loads of rain across Victoria. The weather went from blue sky in Alice Springs to pouring rain in Melbourne. Departing Alice - nice blue sky! Landed at Avalon- welcome to Victoria!